Easily spotted, this stand-alone, home-like building houses a trendy eatery that serves contemporary dishes inspired by Mexican cuisine. It serves appetizers such as "Turtle Rolls" (flour tortilla, black bean puree, avocado and cabbage) and grilled shrimp mini-tacos, salads (such as roasted beets with grilled goat cheese, apple and walnuts with blue cheese) and soups (such as tortilla with corn tortilla strips and sweet corn with tortilla strips, plus sour cream). Entrées feature pasta, rice, chicken, fish and beef. Desserts are a favorite here as well, with such standouts as "three milks" sponge cake with grilled pineapple, choco-flan cake with Kahlua sauce and a brownie sundae stuffed with mint chocolate chip ice cream. Wed- Sun: 8 a.m.-9 p.m.; Mon: 8 a.m.-3 p.m. It's been a few years since Colin Ambrose, chef-owner of the successful Estia in Amagansett, opened Estia's Little Kitchen, a charming cottage on the outskirts of Sag Harbor. 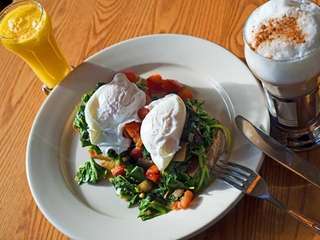 Like its older sibling, the restaurant offers breakfast and lunch in coffee-shop surroundings and, come evening, is transformed into a white-tablecloth hideaway. Here, the chef uses impeccably fresh fruits, vegetables and herbs, most grown in the Amagansett restaurant's garden. At breakfast, light buttermilk blueberry pancakes burst with berries that taste just-picked. An omelet called the East Ender, made of egg whites, onions, mushrooms and feta cheese, is plump and assertively flavorful. Dinner begins with a loaf of peasant bread and a dish of garlicky white bean puree drizzled with extra-virgin olive oil. Irresistible Montauk fish cakes feature three thick, crisp disks revved up by a side of wasabi cream and a sesame-accented seaweed salad. Another appetizer called "vida" stars skewered jumbo shrimps over a marvelous Thai- spiced Caesar salad, the romaine cut into thick strips resembling a slaw. It's difficult to neatly tackle the crab and avocado Napoleon, made with crisp tortilla layers sandwiching cumin-spiked hummus and spiced crabmeat, but the combination of flavors and textures makes it worth negotiating. You'll have no trouble with Ambrose's divine roasted chicken, a bird that's boned, pan-roasted and finished in the oven, imparting the best qualities of both fried and roast chicken. On the side are fluffy mashed potatoes plus vibrant sauteed snap peas and carrots. Chicken Bolognese over house-made pappardelle tastes herbal and authentically Italian. Linguini with clam sauce, a winning spin on a classic, is made with bacon and lots of fresh littleneck clams. Finish with creme brulee, crackling on the outside, silky beneath.Or fragrant, flaky apple pie. Or a brownie sundae made with super-fudgy homemade brownies, freshly whipped cream, vanilla ice cream, fresh raspberries and--the clincher--frozen bananas enrobed in dark chocolate and crushed peanuts.You'll smile.